Praise God! We are thankful to be celebrating 22 years of marriage and 20 years of ministry together. God is faithful and continues to bless us throughout the journey of all we have done together. From 11 mission trips to Europe in 11 different countries: Romania, Latvia, Kosovo, Switzerland, France, Spain, Germany, England, Ireland, Norway, Sweden, to all the ministry in the Latin American context: In Argentina, throughout 3 different states in Mexico, as well as ministering to the Hispanic community throughout the US. Also in the past few years traveling and ministering in North America: in Montana, Colorado, Arizona, Hawaii and in BC, Canada---all new ground for us, along with other major ministry trips including Africa and Japan. We’ve been blessed to see His hand of grace over our lives. In marriage and ministry, we’ve been blessed to see the Holy Spirit work through all our ups and downs, all together for good, as the Spirit of God just goes deeper in our lives all the time. From the earliest days of sharing one car and sometimes just a can of beans for dinner while attending school (Bryan at Fuller Seminary and Mercedes at Biola University) and living in what we called “the old shoebox,” our little 330 sq. ft. apartment back in CdM. From sleeping in beds that didn’t deserve to be called beds--like an old army cot that we were supposed to fit 3 people in the middle of the frozen Swedish winter or a bed in Romania that 6 cats had been hanging out in--yikes, cat allergies! As we’ve endured the cross and sacrificed, God has been with us and blessed us in many ways. 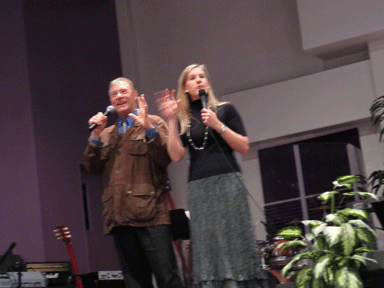 Preaching and ministering together at some recent meetings where the Lord moved really powerfully! We feel blessed to be minstering together as a team for 20 years now! 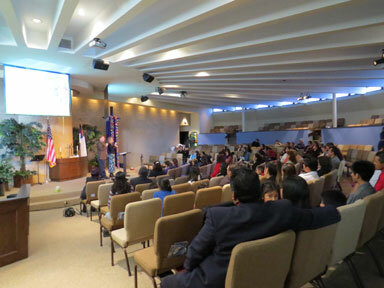 Preaching at Centro Cristiano Esperanza in Orange County. His grace keeps flowing and going deeper in our lives with His Spirit all the time. We keep experiencing the Kingdom of God encountering us at every turn. While at home or out on the road, we just keep encountering the glorious and loving presence of Christ. Praise God, He keeps bringing surprises: We were at a house meeting recently, which was more of a going away party for some friends, when the Holy Spirit fell on a young guy when I accidentally bumped into him in the kitchen. I knew the Lord was about to turn this party upside down. We ended up having a Holy Ghost outpouring for all gathered, including at the end when the Lord poured His Spirit over many of the youth in a powerful way! Glory to God! We were encouraged recently to meet some people whose lives were dramatically changed through our ministry: A young guy named Hugo who now attends Biola University (Mercedes’ Alma Mater where she majored in missions) and is getting ready for his first mission trip, which will be into a Muslim country, excitedly shared with us how he actually got saved when we were preaching at a youth camp we did some years back and was also filled with the Spirit. This set him on a course of fully following God and he is now preparing for the mission field. Another brother named Scott up in Santa Barbara, where we ministered recently, shared how the point of demarcation in his Christian life came when we prayed for him and he was filled with the Holy Spirit. He told us how that catalyzed everything in his Christian life and propelled him forward. Also, a couple who ministers out in the desert region shared recently how their daughter has gone into mission work because of our influence and ministry. Another brother recently shared how he was filled with the Spirit and transformed when we ministered at his church down near the border some years back. It’s encouraging to hear testimonies like this. Getting firsthand personal information of what happened when you prayed for, or led someone to the Lord, is a great blessing. 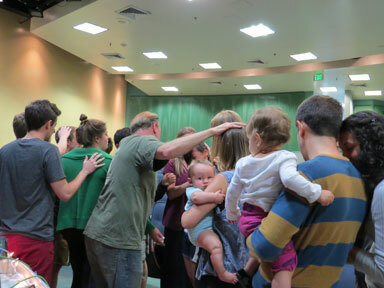 Young children getting filled with the Holy Spirit in a powerful way as we pray over them. The fire of God falling on the youth at a recent meeting -- it was like a wave of fire just washed over them all of a sudden!!! 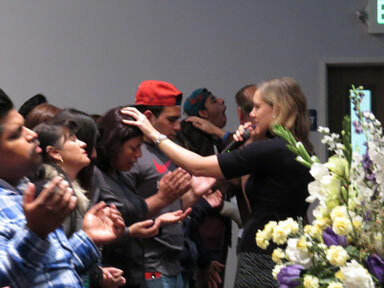 The Spirit was poured out and three people came to salvation when we ministered down south recently at ICA Church. We also had a blessed time visiting the pastors who are old friends. It was fun to reminisce about the old church building where we ministered with them years back that looked basically like an old broken down trailer. It is encouraging to see the husband and wife team of Chary and Frank going strong and moving forward with God’s purposes! Obviously they were stoked because they asked us to do their youth camp afterwards! Many were filled with the Holy Spirit that night, as well as a young person getting saved. There was also quite a response to words for healing and saw many prayed for effectively. We ministered at a church up in inland Orange County where we saw about 7 people receive the Lord as well as a lot of people touched with healing power and compassion. Many testified how they experienced the presence of God’s freeing and renewing power come over them as we ministered to them. There were those introduced to the Kingdom of God, as well as those who were actually experiencing the Kingdom’s healing and freeing touch upon their lives. We were out with the pastor afterwards, which turned out to be an important time of ministry itself since this pastor’s spouse passed away not too long ago. Ministry to the one person is just as important as it is to the many! While up the coast recently, we had a spontaneous encounter with a young maid at a motel. It turns out she needed prayer. She was walking by numerous times and I began to wonder if maybe God wanted us to talk with her. Patrick stepped in dog poop right then on the way to the car. This led to being forced to talk to her—the Lord can surely use unusual things—to get some cleaning materials. After some discussion in Spanish, it turned out she was a believer who needed prayer, but she rarely got to go to church because of her work schedule. We ended up talking and praying with her and could visibly see her life and heart had encountered God’s love in a major and blessed way. In Victoria, B.C., Canada, with Bob Brasset and Greg Snead, where we had a powerful time in the Lord together and out doing power evangelism at a local mall! Ministering up in Santa Barbara, originally connected by divine appointment with the crew up there, the Lord keeps pouring out divine power! We got back from another trip to Canada recently. We did a meeting in Vancouver that had people with pretty conservative backgrounds evangelically—a group from a Mennonite church—get ministered to powerfully by the Holy Spirit! Sharing about the Reformation helped open them up since the Mennonites are part of the Anabaptist movement that came out of Switzerland. Having some historical background on Christian history and the Reformation helped put them at ease and open them up. One woman had tears streaming down her face as the Lord touched her, and our friend holding the meeting felt the presence of God moving through her with in a way she’d never experienced before. We also had amazing timing in this trip! Our friend Dave over on Vancouver Island in the city of Victoria was in a transition and just happened to have an empty apartment we could use for one week if we came over. We ended up doing a meeting in the Victoria area, as well as having some really powerful and spontaneous Holy Ghost ministry times. In the meeting, God really touched a family that had suffered through a hard time after the husband fell from a ladder at his job and was seriously injured and had been unable to work or do anything for a long time. Sharing about my own trials when injured helped us minister to them. We ended up connecting with some leaders too. Bob Brasset was connected with Harald Bredesen back when Harald had a church in Victoria. The Lord moved on our time together powerfully. It was very prophetic and we went out afterwards and did some power evangelism at a local mall together. 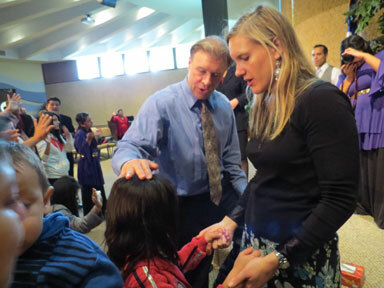 Many divine appointments took place and we witnessed and prayed with numerous people. It felt just like old Holy Ghost times with Harald! It’s interesting how God keeps doing stuff with Canada with us lately!?! Unlike the conference we did last summer, this was a spontaneous trip. In fact, I had a dream prior to this trip indicating it would be like that. God used some unique things to bring it about: My stepsister invited us up to their time-share cabin in Whistler after a friend cancelled on them and they had an extra room. So after praying on it and getting confirmation we headed up to Canada. It was a rare opportunity to enjoy the area and get a little time on the slopes—something we haven’t done in years! We only have been connected to her for a few years since she reconciled with my stepfather. So we’ve been witnessing to her and her husband and they have been quite receptive; we’ve actually even prayed with them here and there. 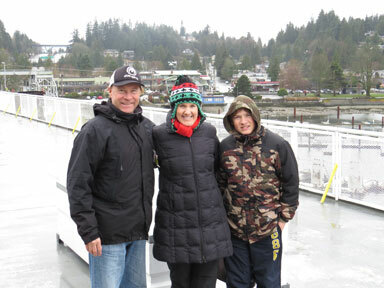 We’d been hearing about some crazy cold surf on Vancouver Island. 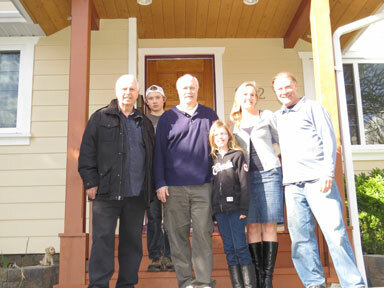 A small surf community has arisen out there at the end of Canada’s only paved road to the open Pacific. A brother told us before that he heard about a group of intercessors praying for us somewhere in that area. We felt the Lord leading us and took a trip out there for a couple of days and were able to experience a radical time of retreat and encounter of God’s presence---all three of us, including Patrick, got powerfully touched by the Holy Spirit---out in the beautiful Canadian rain forest as well as some fun cold Canadian waves, before the long trip back home. Taking the ferry to Vancouver Island in British Columbia, Canada. 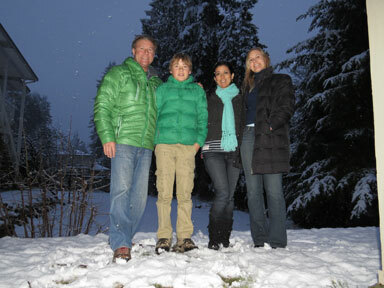 With our friend Aura after a big storm dumped several inches of snow in the city of Vancouver in B.C. Canada. We’ve been continuing to have some powerful times at some Prayerfests lately out in Hemet. We decided to head out for a recent one, even though we were all battling being sick. God blesses perseverance as a young 14-year-old girl was led to the Lord and touched by God’s presence that night right as we came in. Mercedes’ Spanish skills became integral in this young lady coming to the Lord. We’ve been ministering to the family as they go through some severe trials and praise God we’ve seen the mother get powerfully ministered and the daughter now saved in spite of the difficulty they are enduring. We also saw the fire fall and fill those there with the Holy Spirit as we prayed and gave some words of knowledge. The presence of God is what makes all the difference when we gather together as the Body of Christ!!! We so appreciate your support and prayers and would ask that you consider giving to our efforts if you haven’t done so. Your support is so important in helping us fulfill the things God calls us to do and keeps us working together to touch lives with God’s love and power!